Elderberry can be found growing locally in many places in our region. If you go foraging, always verify your finds. Almost a full quart of Ali's homemade elderberry, ginger and concord grape syrup, spiced with cinnamon and clove. A smattering of dried elderberries. The elderberry has long been used in the kitchen as well as in the medicine cabinet. 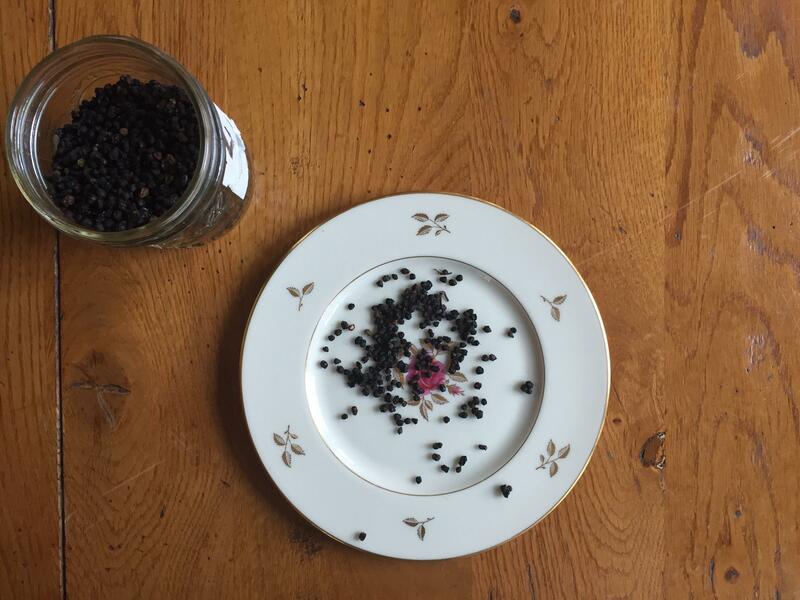 Dried elderberries give all year round in taste; the many things you can cook them with and for their health benefits. Ali Berlow speaks with Holly Bellebuono, an herbalist, educator and author, living in West Tisbury. In a large bowl, blend all the ingredients (except the sugar) together. Store in a glass jar with a tight-fitting lid. To use, add 1 to 2 tablespoons of mulling spices and 2 to 4 teaspoons of sugar to a half-gallon of apple cider or lemonade in a large pot. Simmer over low heat for 15 to 20 minutes, stirring occasionally. Strain and garnish with fresh lemon slices or candied ginger. Sip while hot. Alternatively, brew this as a decoction by simmering 2 teaspoons of the herbal mixture for every cup of boiling water for 12 to 15 minutes. Yields about 1 quart dry blend. Support your immune system with daily teaspoons of this intense, heady, and aromatic vinegar. My children are vinegar fanatics and regularly sip this vinegar from a spoon all winter long. They love the tangy flavor and intensity in the mouth. Make this vinegar in the harvest season of autumn so it’s ready for you to take at the first sign of a cold or the flu; mix a teaspoon of the vinegar in a small cup of water and sip either cold or hot. Gently warm the vinegar in a saucepan on the stovetop. Place the herbs in a 1-quart glass jar. Pour the warmed vinegar over them, gently swirl to remove air bubbles, and cap tightly with a non-metal lid. Place the jar on a small dish to catch any liquid that may ooze out, and store in a dark cupboard or shelf for 2 weeks, or up to 6 months. Strain, reserving the liquid. Store the vinegar in a clean jar or bottle, labeled, and use within two years. This blend of immune-supporting herbs has a strong and pronounced, but not unpleasant, medicinal flavor and is good mixed with strong fruits such as pineapple, grapefruit, and orange. Combine the herbal powders in a small jar, label, and store. To use, blend the frozen fruits with the pineapple juice. Add the Immunity Powder Smoothie Mix and blend well. Drink cold. Yields 1/2 cup dry mix, or about 3 cups smoothie. Dave Dewitt has a hard time describing the taste of the leafy Japanese herb called shiso. Chestnuts are common snack food in Europe—you find them roasting on every street corner in the fall. But in the U.S., they're rare. This week on the Local Food Report, Elspeth talks with Falmouth farmer Carrie Richter about her own locally grown chestnuts. 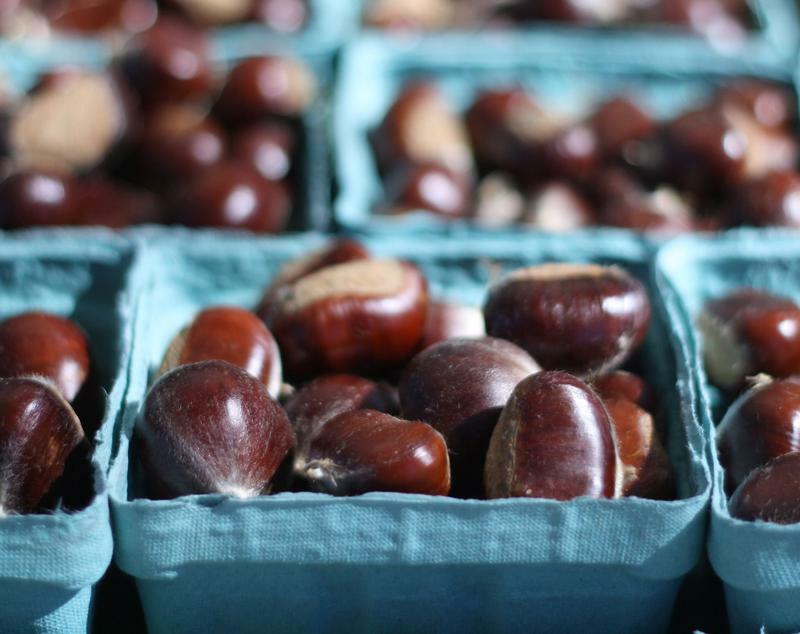 Find out more about chestnuts and many ways to prepare them, along with information about the American Chestnut Society, at Elspeth's blog, Diary of a Locavore. 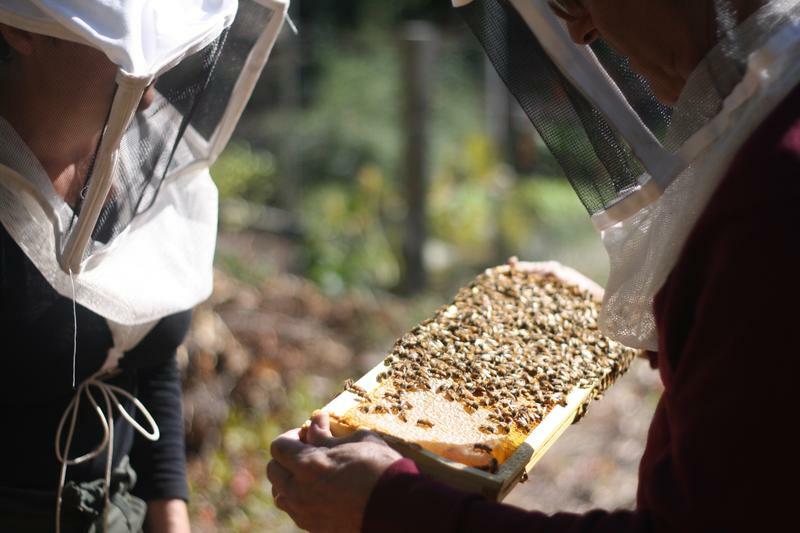 Now that it's fall, local beekeepers need to prepare their hives for colder weather. This week on The Local Food Report, Elspeth Hay looks into a Wellfleet beehive and learns about the massacre of drones (a good thing), mouse incursions (bad thing), and how to tell if the queen is healthy.